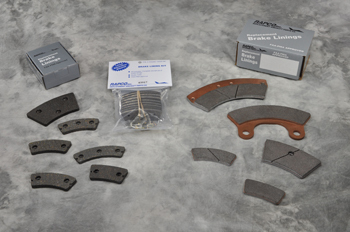 RAPCO produces quality FAA-PMA approved replacement brake linings for Cleveland and McCauley brake assemblies on most general aviation aircraft. Both organic and metallic linings are available. Organic linings are actually made from a semi metallic mix. RAPCO combines brass, copper and Kevlar fibers with a high temperature binding compound to provide outstanding performance and long service life. Most RAPCO organic linings have a built in wear indicator, which reduces the risk of damage to the brake disc and helps to optimize lining life. RAPCO organic linings are available in boxes of 10 or in kit form. When installing brake linings be sure to check aircraft's maintenance manual for the proper torque value of back plate bolts. Over torquing can damage brake cylinders. After installing new brake linings or new brake discs the installer must confirm that the wheel assemblies rotate freely while properly jacked above the ground. If they do not turn freely the aircraft must not be returned to service until the problem has been resolved. Failure to do so can cause loss of aircraft control, reduced take off performance, or fire, possibly resulting in death, bodily injury, or property damage.